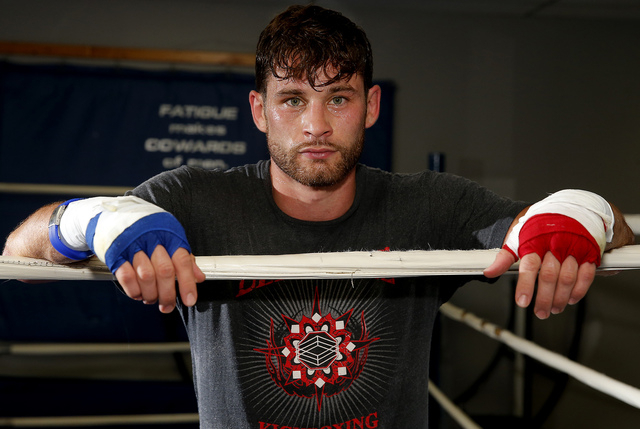 As Chris Algieri wraps up preparations for the biggest fight of his life, he does so with the knowledge that a lot more people know about him now than they did before he agreed to fight Manny Pacquiao on Nov. 22 in Macau. “It’s good in that I always wanted this. It’s not good because I’m a private person, and I’m pretty low-key,” Algieri, the World Boxing Organization’s junior welterweight champion, said Tuesday before working out at the Palazzo, where he has been living and training for the past few weeks. Last week, Newsday, Algieri’s hometown newspaper in Long Island, N.Y., ran a long story on the 30-year-old boxer. Algieri called it “overwhelming.” He was already popular on Long Island (he’s from Huntington), and the article only boosted his celebrity. Algieri (20-0, eight knockouts) has no such problems in Las Vegas. He has trained here before, renting a condo and using local gyms for his workouts. But he has enjoyed the trappings of his “gym,” which was converted from an unused restaurant in the Strip casino. “Yeah, it’s pretty easy, I ride the elevator to go to work and take the elevator back to go home,” he said. It’s a far easier commute than the one he used to endure traveling from Long Island to Gleason’s Gym in Brooklyn, N.Y. Algieri would make the hour-plus drive out of necessity because he couldn’t find the kind of quality sparring partners on Long Island. In Las Vegas, he’s had no problem finding sparring partners. Algieri and his team will leave for China early Thursday to get acclimated with the environment and the time change half a world away. He remains confident that he can do to Pacquiao, the WBO welterweight champ, what he did to Ruslan Provodnikov in June, when he survived a brutal first two rounds to win a 12-round split decision at the Barclays Center in Brooklyn and the WBO junior welterweight belt. The Palazzo will show the fight on closed circuit TV in its ballroom. Tickets, priced at $50, $250 and $500, are on sale at The Venetian box office or venetian.com/clashincotai. ■ CHAVEZ LEAVES — Julio Cesar Chavez Jr. has signed with Al Haymon after being promoted by Top Rank during his career. The former world middleweight champion last fought in March, when he defeated Bryan Vera. But Top Rank said Chavez has one fight left on his contract and has taken him to court. Chavez’s attorneys argue that his contract with Top Rank ended in September. It’s possible the sides could work out a deal in which Chavez pays Top Rank to get out of the fight should a judge rule in Top Rank’s favor. Chavez has said he plans to fight in early 2015. ■ RAMIREZ ADDED — 2012 U.S. Olympian Jose Ramirez has been added to the Top Rank card on Dec. 13 at The Cosmopolitan of Las Vegas. The 22-year-old, 12-0 with nine KOs, is coming off an impressive first-round knockout of David Rodela on Oct. 25 in Fresno, Calif. The fight was for the North American Boxing Federation’s vacant junior welterweight title. Ramirez’s opponent for the eight-round fight, which will be on the undercard of the Timothy Bradley-Diego Chaves main event, has yet to be determined. Ramirez was in the Philippines this past week, training and sparring with Pacquiao.